SIOUX FALLS, S.D. – It was only fitting that the final two points of a championship season for Indiana Wesleyan University Tuesday night were scored by Kyle Mangas. Mangas delivered from start to finish all season long for the Wildcats. Now, the classy, humble and talented cager is a national champion. The former Warsaw star tallied a team-high 23 points Tuesday night as the No. 4 Wildcats beat No. 7 Saint Francis 84-71 in the title game of the NAIA Division II National Championship in the Sanford Pentagon. 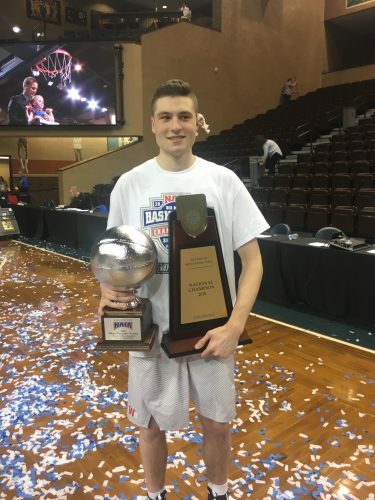 Mangas, who hit two free throws with 12 seconds to play for the final scoring, capped off an amazing freshman season by leading the Wildcats to their third national title. IWU claimed national titles in both 2014 and 2016 and now becomes just the fourth program to win a trio of NAIA national championships. Mangas sparked his No. 1 seeded team to its fourth win this season over Crossroads League foe Saint Francis from Fort Wayne. Guard Mangas netted 15 first-half points as the Wildcats built a 40-29 halftime lead. IWU trailed by a 5-0 margin to open the game before taking control. The Wildcats seized the game as Mangas hit 5-8 shots, including 2-3 from distance, and went 3-3 from the free throw line in the opening half. IWU built its largest lead of the game at 46-29 in the second half before the Cougars stormed back within 51-50. The Wildcats led 66-63 before scoring five straight points to make it 71-63. Saint Francis got within 73-68 late before IWU iced the title with an 11-3 run to end the contest. The Wildcats, who won their final nine games of the season to finish at 31-7, got another big game from Evan Maxwell. The 6-10 junior, who transferred from Kansas, had 20 points and eight rebounds. Jacob Johnson had 14 points, while Grant Smith scored 13 and Canaan Coffey 12 for the champions. But it was once again Mangas who led the way as he has done all season long. The 6-3 guard finished 8-15 from the field, including 2-5 from deep. He hit 5-5 from the line and had four rebounds and three assists with just one turnovers. Mangas played the entire game before leaving for the final 12 seconds after his pair of free throws. Mangas, who became the first freshman to win the Crossroads Player of the Year this season, scored 112 points in the four wins over the Cougars. He finished his season with a program record of 818 points, shattering the old school standard of 756 scored by Lane Mahurin during the 2016-17 season. Mangas averaged better than 21 points-per-game for the Wildcats, leading coach Tonagel’s team to both the Crossroads League regular season and conference tournament championships along the way. Mangas, who was twice the Ink Free News Player of the Year during his brilliant prep career playing for coach Doug Ogle at WCHS, was named the Tournament MVP following the championship game victory. Mangas, the son of Tim and Ann Mangas, was an Indiana All-Star in 2017 after finishing fourth all-time in career scoring at Warsaw and leading his team to 61 wins in his high school career. The Tigers won three straight NLC titles and back-to-back Class 4-A sectional championships led by Mangas. IWU hit on 30-55 shots in the game, including 8-20 from 3-point land. The Wildcats, who beat Saint Francis 69-66 in the title game in 2016, were 16-19 from the line. Former Columbia City star Derek Hinen led Saint Francis. The senior guard scored a game-high 24 points. Bryce Lienhoop had 17 points for the Cougars. Both Hinen and Lienhoop were named to the All-NAI Championship Team for the Cougars, who lost in the national title game for the third straight year. Saint Francis, which finishes at 29-9, shot 28-62 overall from the field. The Cougars were 8-23 from distance and 7-11 from the line. Mangas earned the Tournament MVP trophy following his stellar, consistent play throughout the national championships. Maxwell was also named to the All-Tournament team for the Wildcats. Tonagel, now in his 13th season, was tabbed as the NAIA National Coach of the Year. A Welcome Home Celebration for the Wildcats is planned for Wednesday night inside Luckey Arena on the IWU campus in Marion.